Endoscopic retrograde cholangiopancreatography (ERCP) is a technique that uses a combination of luminal endoscopy and fluoroscopic imaging to diagnose and treat conditions associated with the pancreatobiliary system. The endoscopic portion of the examination uses a side-viewing duodenoscope that is passed through the esophagus and stomach and into the second portion of the duodenum (see the video and image below). This video, captured via endoscopic retrograde cholangiopancreatography, shows side-viewing duodenoscope being inserted and advanced into stomach and duodenum. Scope is then reduced into short position, bringing ampulla into view. Video courtesy of Dawn Sears, MD, and Dan C Cohen, MD, Division of Gastroenterology, Scott & White Healthcare. Side-viewing endoscope. Used with permission from the Johns Hopkins Division of Gastroenterology and Hepatology (www.hopkinsmedicine.org/gi). Illustration Copyright© 1998-2003 by The Johns Hopkins Health System Corporation and The Johns Hopkins University. Illustration created by Mike Linkinhoker. With the scope in this position, the major duodenal papilla is identified and inspected for abnormalities. This structure is a protrusion of the hepatopancreatic ampulla (also known as the ampulla of Vater) into the duodenal lumen. 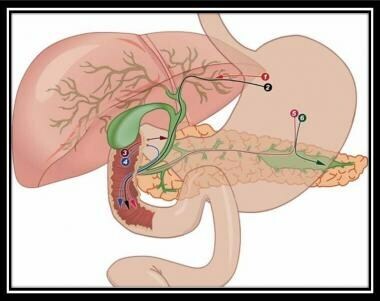 The ampulla is the convergence point of the ventral pancreatic duct and common bile duct (CBD) and thus acts as a conduit for drainage of bile and pancreatic secretions into the duodenum. The minor duodenal papilla is also located in the second portion of the duodenum and serves as the access point for the dorsal pancreatic duct. Evaluation of the dorsal pancreatic duct with ERCP is rarely performed; indications are discussed below. After the papilla has been examined with the side-viewing endoscope, selective cannulation of either the CBD or the ventral pancreatic duct is performed. Once the chosen duct is cannulated, either a cholangiogram (CBD) or a pancreatogram (pancreatic duct) is obtained fluoroscopically after injection of radiopaque contrast material into the duct. ERCP is now primarily a therapeutic procedure; thus, abnormalities that are visualized fluoroscopically can typically be addressed by means of specialized accessories passed through the working channel of the endoscope. Because ERCP is an advanced technique, it is associated with a higher frequency of serious complications than other endoscopic procedures are. Accordingly, specialized training and equipment are required, and the procedure should be reserved for appropriate indications. A review by Freeman et al, using data from 2004, estimated that about 500,000 procedures were performed annually in the United States. However, because of a decrease in diagnostic ERCP with the advent of endoscopic ultrasonography (EUS) and magnetic resonance cholangiopancreatography (MRCP), this number is likely decreasing. Imaging techniques currently used in the diagnosis of hepatobiliary processes include computed tomography (CT), ultrasonography (US), EUS, and MRCP. The use of these modalities, in conjunction with pertinent clinical information (eg, the clinical history, physical examination findings, and laboratory data), can help select those patients for whom ERCP is most appropriate. 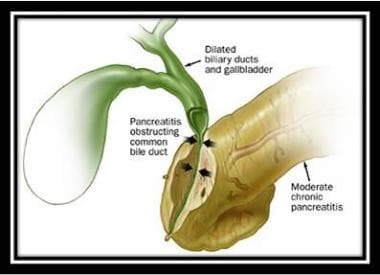 Biliary obstruction secondary to chronic pancreatitis. Used with permission from the Johns Hopkins Division of Gastroenterology and Hepatology (www.hopkinsmedicine.org/gi). Illustration Copyright© 1998-2003 by The Johns Hopkins Health System Corporation and The Johns Hopkins University. Illustration created by Mike Linkinhoker. Technique for pancreatic stone extraction. Used with permission from the Johns Hopkins Division of Gastroenterology and Hepatology (www.hopkinsmedicine.org/gi). Illustration Copyright© 1998-2003 by The Johns Hopkins Health System Corporation and The Johns Hopkins University. Illustration created by Mike Linkinhoker. Pancreatic stent placement for pseudocyst drainage. Used with permission from the Johns Hopkins Division of Gastroenterology and Hepatology (www.hopkinsmedicine.org/gi). Illustration Copyright© 1998-2003 by The Johns Hopkins Health System Corporation and The Johns Hopkins University. Illustration created by Mike Linkinhoker. Structural abnormalities of the esophagus, stomach, or small intestine may be relative contraindications for ERCP. Examples are acquired conditions such as esophageal stricture, paraesophageal herniation, esophageal diverticulum, gastric volvulus, gastric outlet obstruction, and small-bowel obstruction. An altered surgical anatomy, such as is seen after partial gastrectomy with Billroth II or Roux-en-Y jejunostomy, may also be a relative contraindication for ERCP. Several factors play a role in choosing the best approach for ERCP access in patients with altered surgical anatomy in cases where ERCP is indeed indicated. These factors include long versus short Roux limb, native papilla versus bilioenteric anastomosis, prior sphincterotomy, anticipated accessory use (eg, sphincter of Oddi manometry), surgical risk, likelihood of repeat procedures, and possibility of internal hernias. Endosonography-guided cholangiopancreatography. Used with permission from Baishideng Publishing Group, Inc (Fig 1 from Perez-Miranda M, de la Serna C, Diez-Redondo P, Vila JJ. Endosonography-guided cholangiopancreatography as a salvage drainage procedure for obstructed biliary and pancreatic ducts. World J Gastrointest Endosc. Jun 16 2010;2(6):212-22). The presence of acute pancreatitis is typically considered a relative contraindication as well, unless the etiology of the pancreatitis is gallstone-related and the therapeutic goal is to improve the clinical course by means of stone extraction. [15, 16] In addition, ERCP with sphincterotomy or ampullectomy is relatively contraindicated in coagulopathic patients (international normalized ratio [INR] >1.5 or platelet count <50,000/µL). Before ERCP, all of the patient’s previous abdominal imaging findings (from CT, magnetic resonance imaging [MRI], ultrasonography, and cholangiography or pancreatography) should be reviewed; this can facilitate location of the pathology during ERCP, as well as help pinpoint any changes that occurred since the previous imaging was performed. A scout radiograph should be obtained while the patient is on the fluoroscopy table and before insertion of the duodenoscope; this image can act as a baseline for comparison with subsequent fluoroscopic images taken after contrast injection. The patient's surgical history should be reviewed before the procedure to determine whether there is anything in the surgical anatomy that may be a contraindication for ERCP. To minimize the patient's exposure to radiation, fluoroscopic images should be obtained only as necessary during the procedure; some fluoroscopy machines can be adjusted to minimize the frequency of image acquisition. Deep sedation is desirable during ERCP because a stable endoscopic position in the duodenum is important for proper cannulation, therapeutic intervention, and avoidance of complications. Multiple randomized controlled trials and meta-analyses have shown rectally administered NSAIDs to be effective in reducing the incidence of PEP, the occurrence of moderate to severe pancreatitis, and the length of hospital stay in high-risk patients who develop PEP. [19, 20, 18, 21, 17] Indirect comparative effectiveness studies have suggested that rectal NSAIDs alone may be superior to pancreatic duct stenting in preventing PEP as a simple, easily administered, safe, inexpensive, and effective treatment modality,  but further studies are needed to help confirm these results through direct comparison with prospective randomized controlled data. In a subsequent prospective randomized, double-blinded, placebo-controlled trial, 192 patients at high risk for PEP received standard normal saline solution (NS) plus placebo (n=48), NS plus indomethacin (n=48), LR plus placebo (n=48), or LR plus indomethacin (n=48). The primary outcome was PEP; the secondary outcomes were severe acute pancreatitis, localized adverse events, death, length of stay, and readmission. The investigators found that the combination of LR and indomethacin led to reductions in PEP incidence and readmission rate as compared with the combination of NS and placebo. Those at higher risk for post-ERCP hemorrhage include patients with either a pathologic or an iatrogenic coagulopathy. Anticoagulant or antithrombotic therapy should be discontinued before elective ERCP (generally 5-7 days beforehand), and the prothrombin time (PT) and partial thromboplastin time (PTT) should be evaluated on the day of the procedure. If the PT and PTT are significantly abnormal, the procedure should be rescheduled if it is not an emergency. If there is an urgent need for ERCP, reversal of the coagulopathy with fresh frozen plasma may be required. Most mucosal perforations occurring during ERCP are periampullary and are associated with sphincterotomy. Periampullary perforations are usually retroperitoneal and can often be managed with supportive care rather than immediate surgical intervention. 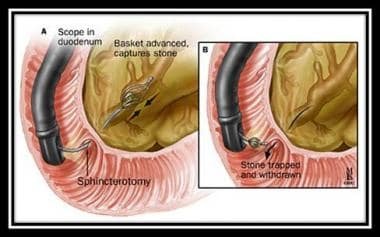 This complication can be prevented in many cases by following proper landmarks while performing sphincterotomy and by taking care to not cut beyond the intraduodenal portion of the CBD. Perforations occurring away from the ampulla are typically due to traumatic endoscope passage, often related to limited visualization of the lumen. 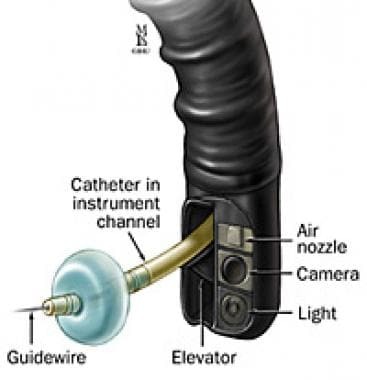 As a general rule, the duodenoscope should never be forced against significant resistance during insertion. The forceps elevator should be in the closed position during passage of the endoscope down the lumen because it may lacerate the adjacent tissue if left in the open position. In a study of post-ERCP complications that pooled prospective patient survey data from almost 17,000 patients undergoing the procedure, ERCP-related morbidity secondary to pancreatitis, bleeding, perforations, and infections was 6.85%, of which 5.17% was graded as mild-to-moderate and 1.67% as severe; ERCP-specific mortality was 0.33%. Pancreatitis was the most common complication (3.47% of patients), followed by infection (1.44%), bleeding (1.34%), and perforations (0.6%). Freeman ML, Guda NM. Prevention of post-ERCP pancreatitis: a comprehensive review. Gastrointest Endosc. 2004 Jun. 59 (7):845-64. [Medline]. McCune WS, Shorb PE, Moscovitz H. Endoscopic cannulation of the ampulla of vater: a preliminary report. Ann Surg. 1968 May. 167(5):752-6. [Medline]. Cohen S, Bacon BR, Berlin JA, Fleischer D, Hecht GA, Loehrer PJ Sr. National Institutes of Health State-of-the-Science Conference Statement: ERCP for diagnosis and therapy, January 14-16, 2002. Gastrointest Endosc. 2002 Dec. 56(6):803-9. [Medline]. Cotton PB. Analysis of 59 ERCP lawsuits; mainly about indications. Gastrointest Endosc. 2006 Mar. 63(3):378-82; quiz 464. [Medline]. [Guideline] Adler DG, Baron TH, Davila RE, Egan J, Hirota WK, Leighton JA, et al. ASGE guideline: the role of ERCP in diseases of the biliary tract and the pancreas. Gastrointest Endosc. 2005 Jul. 62(1):1-8. [Medline]. [Guideline] ASGE Standards of Practice Committee., Chathadi KV, Chandrasekhara V, Acosta RD, et al. The role of ERCP in benign diseases of the biliary tract. Gastrointest Endosc. 2015 Apr. 81 (4):795-803. [Medline]. [Full Text]. [Guideline] ASGE Standards of Practice Committee., Chandrasekhara V, Chathadi KV, Acosta RD, et al. The role of endoscopy in benign pancreatic disease. Gastrointest Endosc. 2015 Aug. 82 (2):203-14. [Medline]. [Full Text]. [Guideline] ASGE Standards of Practice Committee., Muthusamy VR, Chandrasekhara V, Acosta RD, et al. The role of endoscopy in the diagnosis and treatment of inflammatory pancreatic fluid collections. Gastrointest Endosc. 2016 Mar. 83 (3):481-8. [Medline]. [Full Text]. [Guideline] ASGE Standards of Practice Committee., Eloubeidi MA, Decker GA, Chandrasekhara V, et al. The role of endoscopy in the evaluation and management of patients with solid pancreatic neoplasia. Gastrointest Endosc. 2016 Jan. 83 (1):17-28. [Medline]. [Full Text]. [Guideline] ASGE Standards of Practice Committee., Muthusamy VR, Chandrasekhara V, Acosta RD, et al. The role of endoscopy in the diagnosis and treatment of cystic pancreatic neoplasms. Gastrointest Endosc. 2016 Jul. 84 (1):1-9. [Medline]. [Full Text]. [Guideline] ASGE Standards of Practice Committee., Chathadi KV, Khashab MA, Acosta RD, Chandrasekhara V, Eloubeidi MA, et al. The role of endoscopy in ampullary and duodenal adenomas. Gastrointest Endosc. 2015 Nov. 82 (5):773-81. [Medline]. [Full Text]. Lopes TL, Wilcox CM. Endoscopic retrograde cholangiopancreatography in patients with Roux-en-Y anatomy. Gastroenterol Clin North Am. 2010 Mar. 39(1):99-107. [Medline]. Samarasena JB, Nguyen NT, Lee JG. Endoscopic retrograde cholangiopancreatography in patients with roux-en-Y anatomy. J Interv Gastroenterol. 2012 Apr. 2(2):78-83. [Medline]. [Full Text]. Karaliotas CC, Broelsch CE, Habib NA. Liver and Biliary Tract Surgery: Embryological Anatomy to 3D-Imaging and Transplant Innovations. New York: Springer-Verlag/Wein; 2006. 90. Classen M, Tytgat GNJ, Lightdale CJ. Gastroenterological Endoscopy. New York: Thieme Publishing Group; 2010. 790. Puig I, Calvet X, Baylina M, Isava Á, Sort P, Llaó J, et al. How and when should NSAIDs be used for preventing post-ERCP pancreatitis? A systematic review and meta-analysis. PLoS One. 2014. 9(3):e92922. [Medline]. [Full Text]. Ding X, Chen M, Huang S, Zhang S, Zou X. Nonsteroidal anti-inflammatory drugs for prevention of post-ERCP pancreatitis: a meta-analysis. Gastrointest Endosc. 2012 Dec. 76(6):1152-9. [Medline]. Tammaro S, Caruso R, Pallone F, Monteleone G. Post-endoscopic retrograde cholangio-pancreatography pancreatitis: is time for a new preventive approach?. World J Gastroenterol. 2012 Sep 14. 18(34):4635-8. [Medline]. [Full Text]. Elmunzer BJ, Scheiman JM, Lehman GA, Chak A, Mosler P, Higgins PD, et al. A randomized trial of rectal indomethacin to prevent post-ERCP pancreatitis. N Engl J Med. 2012 Apr 12. 366(15):1414-22. [Medline]. [Full Text]. Akbar A, Abu Dayyeh BK, Baron TH, Wang Z, Altayar O, Murad MH. Rectal nonsteroidal anti-inflammatory drugs are superior to pancreatic duct stents in preventing pancreatitis after endoscopic retrograde cholangiopancreatography: a network meta-analysis. Clin Gastroenterol Hepatol. 2013 Jul. 11(7):778-83. [Medline]. Yang D, Draganov PV. Indomethacin for post-endoscopic retrograde cholangiopancreatography pancreatitis prophylaxis: is it the magic bullet?. World J Gastroenterol. 2012 Aug 21. 18(31):4082-5. [Medline]. Parsi MA. NSAIDs for prevention of pancreatitis after endoscopic retrograde cholangiopancreatography: ready for prime time?. World J Gastroenterol. 2012 Aug 14. 18(30):3936-7. [Medline]. Buxbaum J, Yan A, Yeh K, Lane C, Nguyen N, Laine L. Aggressive hydration with lactated ringer's solution reduces pancreatitis after endoscopic retrograde cholangiopancreatography. Clin Gastroenterol Hepatol. 2014 Feb. 12(2):303-7.e1. [Medline]. Mok SRS, Ho HC, Shah P, Patel M, Gaughan JP, Elfant AB. Lactated Ringer's solution in combination with rectal indomethacin for prevention of post-ERCP pancreatitis and readmission: a prospective randomized, double-blinded, placebo-controlled trial. Gastrointest Endosc. 2017 May. 85 (5):1005-1013. [Medline]. Anderson MA, Fisher L, Jain R, Evans JA, Appalaneni V, Ben-Menachem T, et al. Complications of ERCP. Gastrointest Endosc. 2012 Mar. 75(3):467-73. [Medline]. Testoni PA, Mariani A, Giussani A, Vailati C, Masci E, Macarri G. Risk factors for post-ERCP pancreatitis in high- and low-volume centers and among expert and non-expert operators: a prospective multicenter study. Am J Gastroenterol. 2010 Aug. 105(8):1753-61. [Medline]. Fazel A, Quadri A, Catalano MF, Meyerson SM, Geenen JE. 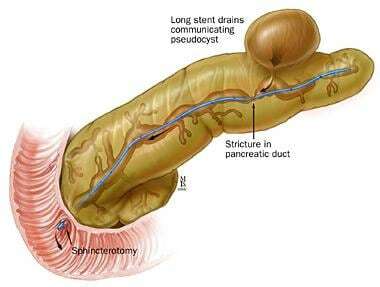 Does a pancreatic duct stent prevent post-ERCP pancreatitis? A prospective randomized study. Gastrointest Endosc. 2003 Mar. 57(3):291-4. [Medline]. Banerjee S, Shen B, Baron TH, et al. Antibiotic prophylaxis for GI endoscopy. Gastrointest Endosc. 2008 May. 67(6):791-8. [Medline]. Brand M, Bizos D, O'Farrell P Jr. Antibiotic prophylaxis for patients undergoing elective endoscopic retrograde cholangiopancreatography. Cochrane Database Syst Rev. 2010 Oct 6. 10:CD007345. [Medline]. How to stop duodenoscope infections. American Gastroenterological Association. March 23, 2015. Available at http://www.gastro.org/press_releases/2015/3/23/how-to-stop-duodenoscope-infections. Sieg A, Hachmoeller-Eisenbach U, Eisenbach T. Prospective evaluation of complications in outpatient GI endoscopy: a survey among German gastroenterologists. Gastrointest Endosc. 2001 May. 53(6):620-7. [Medline]. Andriulli A, Loperfido S, Napolitano G, Niro G, Valvano MR, Spirito F. Incidence rates of post-ERCP complications: a systematic survey of prospective studies. Am J Gastroenterol. 2007 Aug. 102(8):1781-8. [Medline]. Loperfido S, Angelini G, Benedetti G, Chilovi F, Costan F, De Berardinis F. Major early complications from diagnostic and therapeutic ERCP: a prospective multicenter study. Gastrointest Endosc. 1998 Jul. 48(1):1-10. [Medline]. Enestvedt BK, Tofani C, Lee DY, Abraham M, Shah P, Chandrasekhara V, et al. Endoscopic retrograde cholangiopancreatography in the pediatric population is safe and efficacious. J Pediatr Gastroenterol Nutr. 2013 Nov. 57 (5):649-54. [Medline]. Glomsaker TB, Hoff G, Kvaløy JT, Søreide K, Aabakken L, Søreide JA. Patient-reported outcome measures after endoscopic retrograde cholangiopancreatography: a prospective, multicentre study. Scand J Gastroenterol. 2013 Jul. 48(7):868-76. [Medline]. Yao W, Huang Y, Chang H, Li K, Huang X. Endoscopic Retrograde Cholangiopancreatography Using a Dual-Lumen Endogastroscope for Patients with Billroth II Gastrectomy. Gastroenterol Res Pract. 2013. 2013:146867. [Medline]. [Full Text]. Draganov PV, Forsmark CE. Prospective evaluation of adverse reactions to iodine-containing contrast media after ERCP. Gastrointest Endosc. 2008 Dec. 68(6):1098-101. [Medline]. Garg MS, Patel P, Blackwood M, Munigala S, Thakkar P, Field J, et al. Ocular Radiation Threshold Projection Based off of Fluoroscopy Time During ERCP. Am J Gastroenterol. 2017 May. 112 (5):716-721. [Medline]. Guitron-Cantu A, Adalid-Martinez R, Gutierrez-Bermudez J, et al. [Does fentanyl hinder the cannulation of Vater's papilla? A prospective and comparative study.]. Rev Gastroenterol Mex. 2010 Apr-Jun. 75(2):142-8. [Medline]. Schilling D, Rosenbaum A, Schweizer S, Richter H, Rumstadt B. Sedation with propofol for interventional endoscopy by trained nurses in high-risk octogenarians: a prospective, randomized, controlled study. Endoscopy. 2009 Apr. 41(4):295-8. [Medline]. Cheung J, Tsoi KK, Quan WL, Lau JY, Sung JJ. Guidewire versus conventional contrast cannulation of the common bile duct for the prevention of post-ERCP pancreatitis: a systematic review and meta-analysis. Gastrointest Endosc. 2009 Dec. 70(6):1211-9. [Medline]. Tse F, Yuan Y, Moayyedi P, Leontiadis GI. Guide wire-assisted cannulation for the prevention of post-ERCP pancreatitis: a systematic review and meta-analysis. Endoscopy. 2013 Aug. 45(8):605-18. [Medline]. Tyagi P, Sharma P, Sharma BC, Puri AS. Periampullary diverticula and technical success of endoscopic retrograde cholangiopancreatography. Surg Endosc. 2009 Jun. 23(6):1342-5. [Medline]. Freeman ML, Nelson DB, Sherman S, Haber GB, Herman ME, Dorsher PJ. Complications of endoscopic biliary sphincterotomy. N Engl J Med. 1996 Sep 26. 335(13):909-18. [Medline]. Cotton PB, Garrow DA, Gallagher J, Romagnuolo J. Risk factors for complications after ERCP: a multivariate analysis of 11,497 procedures over 12 years. Gastrointest Endosc. 2009 Jul. 70(1):80-8. [Medline]. Aliperti G. Complications related to diagnostic and therapeutic endoscopic retrograde cholangiopancreatography. Gastrointest Endosc Clin N Am. 1996 Apr. 6(2):379-407. [Medline]. Kwon CI, Song SH, Hahm KB, Ko KH. Unusual complications related to endoscopic retrograde cholangiopancreatography and its endoscopic treatment. Clin Endosc. 2013 May. 46(3):251-9. [Medline]. [Full Text]. View of duodenoscope tip. Note that elevator is in closed position and is obscuring instrument channel from view. Fluoroscopy table and dual-screen procedure monitors. Two different sizes of biliary stone baskets. Endoscopic view of major duodenal papilla. Cholangiogram. Note (a) duodenoscope positioned in duodenum with tip at distal aspect of common bile duct and (b) moderately dilated bile duct. Biliary stents. Upper stent is plastic stent; lower stent is self-expanding metal stent (SEMS). Fluoroscopic image of plastic stent in bile duct. Also note guide wire adjacent to stent in bile duct. This video, captured via endoscopic retrograde cholangiopancreatography, shows engagement and cannulation of ampulla using biliary cannulation catheter. Video courtesy of Dawn Sears, MD, and Dan C Cohen, MD, Division of Gastroenterology, Scott & White Healthcare. This video, captured via endoscopic retrograde cholangiopancreatography, shows sphincterotomy being performed. Sphincter of Oddi is being cut by using electrocautery applied to biliary cannulation catheter. Video courtesy of Dawn Sears, MD, and Dan C Cohen, MD, Division of Gastroenterology, Scott & White Healthcare. This video, captured via endoscopic retrograde cholangiopancreatography, shows cannulation of ampulla. Guide wire is then advanced, as seen on fluoroscopy, and wire makes right turn into pancreatic duct. Video courtesy of Dawn Sears, MD, and Dan C Cohen, MD, Division of Gastroenterology, Scott & White Healthcare. This video, captured via endoscopic retrograde cholangiopancreatography, shows cannulation of common bile duct (CBD). Dye is then injected, and CBD is seen on fluoroscopy; there are filling defects suggestive of stones within duct. Video courtesy of Dawn Sears, MD, and Dan C Cohen, MD, Division of Gastroenterology, Scott & White Healthcare. This video, captured via endoscopic retrograde cholangiopancreatography, shows insertion of biliary extraction balloon over guide wire. Sweeps of common bile duct (CBD) are made with extraction balloon to remove stones, sludge, and debris from CBD. Video courtesy of Dawn Sears, MD, and Dan C Cohen, MD, Division of Gastroenterology, Scott & White Healthcare. This video, captured via endoscopic retrograde cholangiopancreatography, shows placement of biliary stent into common bile duct. Video courtesy of Dawn Sears, MD, and Dan C Cohen, MD, Division of Gastroenterology, Scott & White Healthcare. (A) Biliary sphincterotomy and stent placement; (B) corresponding endoscopic retrograde cholangiopancreatography (ERCP) film. Used with permission from the Johns Hopkins Division of Gastroenterology and Hepatology (www.hopkinsmedicine.org/gi). Illustration Copyright© 1998-2003 by The Johns Hopkins Health System Corporation and The Johns Hopkins University. Illustration created by Mike Linkinhoker. Medscape Drugs & Diseases thanks Dawn Sears, MD, Associate Professor of Internal Medicine, Division of Gastroenterology and Hepatology, Scott and White Memorial Hospital, and Dan C Cohen, MD, Fellow in Gastroenterology, Scott and White Hospital, Texas A&M Health Science Center College of Medicine, for assistance with the video contribution to this article.